For more than 25 years, Sister Pearl Blommaert, CUPE National’s 2015 Health and Safety award winner, has worked tirelessly to improve health and safety standards for workers in Saskatchewan and across Canada. In the early 1990s, Blommaert was instrumental in forcing her employer, and then the entire province of Saskatchewan, to adopt violence prevention policies and legislation. This was a first in Canadian Health and Safety Law: since then, all provinces except one have adopted similar legislation. Blommaert’s long list of accomplishments shows her passion and commitment to improving health and safety standards for all workers. She has influenced provisions in the provincial health and safety collective agreement and regulations, musculoskeletal injury prevention, rules for working alone, shift work and psychological harassment—another first in Canadian Occupational Health and Safety Law. 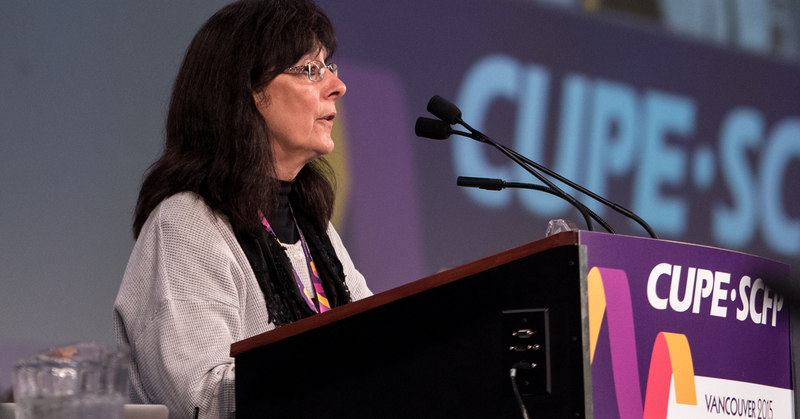 A passionate leader, Blommaert is also the first woman to win CUPE’s Health and Safety award. For two and a half decades, Pearl has worked at all levels of the health and safety system in CUPE. She sat as chair or co-chair of the CUPE Saskatchewan provincial Occupational Health and Safety committee, and the National Health and Safety committee.